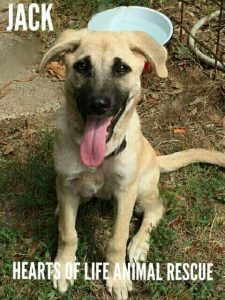 Hearts of Life Animal Rescue Dog of the Week-Meet Jack! Jack is still searching for his forever home! Jack is approximately 9 months old. He is very intelligent, rides great in the car, walks well on the leash and loves everyone he meets. Jack is a puppy and will need an ample amount of chew toys. He is also the perfect age to train to your lifestyle. Jack’s adoption fee is $100.00 which includes all previous vetting, neuter and rabies shot. Please contact Hearts of Life Animal Rescue by phone at 903-439-5019, email adoptonenow@aol.com, www.facebook.com/heartsoflife or Petfinder.com! Hearts of Life Animal Rescue will be at Petsense Friday from 9am-3pm for an adoption event!